Students have raised the issue of seat privatization in reading rooms or student lounges at Chonnam National University (CNU). Obviously, these facilities are public places for every student but some students use them as private property. So, students who have suffered the problem of seat privatization continually bring it up on the online suggestions box on the CNU and library websites. They are complaining that this problem of privatization is particularly serious in reading rooms in almost every college because there is no proper regulation for dealing with people who privatize seats by leaving their belongings at them. For these reason, this article examines the problems of the seat privatization and will attempt to find solutions to the problem. As reading rooms in the library are full of people during the examination period, it is very difficult to find a seat in the reading rooms. However, we can easily see many privatized seats keeping other students from using the seats when they are vacant. Lee Soo-young (Junior, Dept. of English Language & Literature) spoke about her experience when she visited the Library Annex to study. “I saw there was certainly a vacant seat at an electronic ticket machine. But when I went the seat, there has already been occupied by someone. Moreover, many belongings of a certain person were left scattered on the desk such as books, notebooks and even bags with no name. I was embarrassed and could not understand why that situation happened.” In addition to this, many users of the library reading room are suffering from shortage of seats because some people occupied several seats or neglected their seats for a long time. 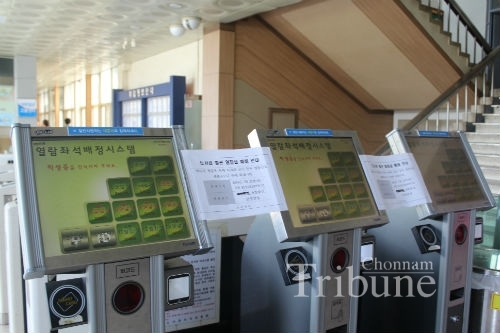 To prevent seat privatization, the library authorities introduced a ‘Smart Card System’ but it has not been operated because of its frequent breakdown. The circumstances of each college library reading room are no different to the Library Annex. Lim Se-hoon (Senior, Dept. of Library & Information Science) said, “I can see many cases of seats privatization in the library. I think the problem in college libraries is more serious than the Library Annex because of the shortage of management manpower and there are no rigid rules.” Actually, library reading rooms in each college are managed by its student council as a self-regulating system, but every college does not have such a system. Also, there is no a department to manage the place and make rules. There is nothing but a sign saying “Do not private the seats for others,” on the wall. What Can CNU Do to Solve the Problem? University authorities try to create more places to solve the fundamental problem of seat shortage behind seat privatization by establishing student lounges in colleges such as the Humanity building and Social Science building. Also, the library authorities and the Library Autonomy Committee (LAC) composed of students have make efforts to regulate the seat privatization problem. But they pointed out the difficulty of eradicating the problem because the number of staff members is not enough to monitor all the situations in the library. One of the members of the LAC said “This problem of seat privatization is more serious, particularly during the examination term. So, we work in shifts and stand in front of the ticketing machine every morning in order to monitor students’ booking and prevent seat privatization.” “When we find out the case in which a student registered using other student’s ID, we take compulsory action to stop that behavior immediately. In addition, we tidy up the privatized desk without notice. During the process, there are times when students who argue with their right to learn and study are on a collision course with us,” he added. How about the other universities? Actually, many other universities have been suffering similar problems to our campus. The University of Seoul and Hankuk University of Foreign Studies have implemented more intensive regulations to prevent seat privatization. 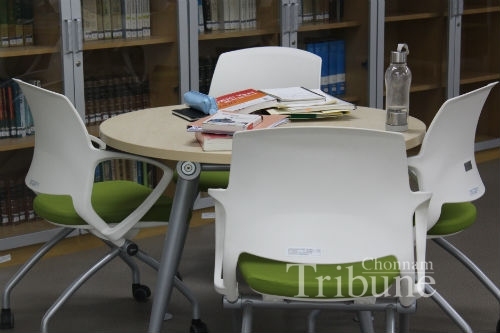 When the library staff discovers a seat privatization, the belongings of the student who has taken the seat are cleaned up immediately without notice. Most students in the universities are optimistic with this solution since they agree that such strict control actions are needed. 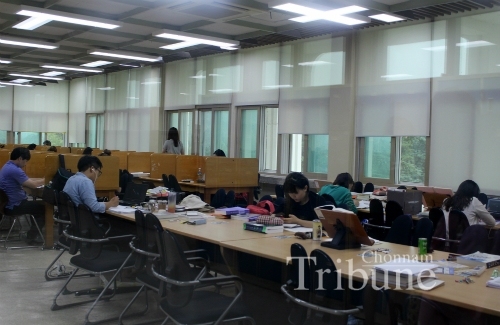 In case of Inha University, every student who uses seats in reading rooms are required to write a table form regarding the reason for a vacant seat and their schedules when they are away from their desk at library. If they do not write the form, the seat will be cleaned up. Some students might allege that it is excusable infringements of their right to study. However, the library is for every student and hard-line policies are needed when someone is being selfish. The authorities of CNU seem not to have completely developed practical methods in order to solve the problem of seat privatization yet. Above all, the most important thing is that students need to take care of educational facilities including libraries on campus. Furthermore, the university authorities should make a new department for supervising the library reading rooms or recruit more student staff members for maintenance. Adopting a hard-line policy like the other universities that are mentioned above, could be the other solution. In conclusion, it is time for CNUians to discuss the problem and seek for real solutions together through multiple ways. The important thing is to promote pleasant learning places for everyone.